I have done a lot of stories on Madeline. Put McCann in the search box above to read them all. When I look at the new age progression computer generated photo of Madeleine McCann at 9-years-old, I can’t help but think of my mother. Three of her children were parentally abducted when they were 2 and 3 years old. My mom, just like Kate and Gerry McCann, spent many birthdays, wondering what her children looked like. Did Jon still have blond hair? Was Jimmy taller than Jon. Was Cheryl watching out for her younger brothers. A year goes by, then another and another. My mother was pretty sure they were alive some where, but were they safe? Were they getting meals and was someone taking them to school. Another year and another. Did they think of her? Did they even remember she existed? Many times I would look at her and catch her looking out into space. As an adult, I know now she was thinking of them and wondering where they were. Eleven years goes by and by the grace of God her children are found. In a little desert town two days from where she was living. On the day she was to be reunited with them, I remember my mom ironing my dress over and over again. I watched her pull on her skirt and adjust her collar more than once. She took my hand, took a deep breath, and we walked out of the motel room into the bright light of the sun to meet three teenagers. Her only hope is they would like her. I asked my mom, not so long ago, if she recognized them that day at the motel. Madeline had a distinct mark on her eye. It’s possible my mother did, too, but it didn’t stop her from recognizing them. 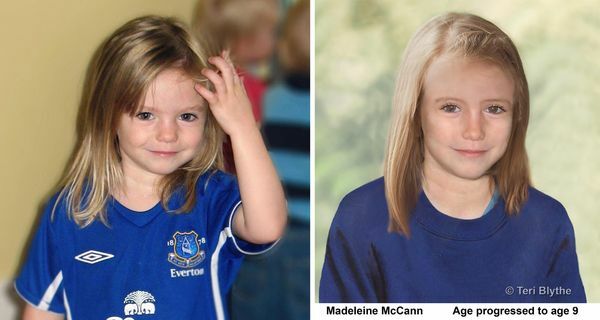 Today, the Scotland Yard announced that after looking at the investigation that the Portuguese police did on Madeleine’s disappearance, they have come away with 195 potential new leads, which leads them to say they believe there is a great chance that Madeleine is alive. “We are releasing the age progression image of her with a specific appeal and are developing material we believe represents genuinely new information,” said Det. Chief Inspector Andy Redwood. The new photo looks to me to be spot on. It is exactly what I think Maddy would look at age 9, but I am not her mother. I hope that someone sees the photo and recognizes Maddy as the girl living next door to them, or going to their school. It may be exactly what Kate and Gerry need to bring their child home, so they don’t have to wait 11 years like my mother did.